What is “3-phosphoglyceryl-lysine or pgK”? – Bio-Synthesis, Inc.
Home › Bioanalysis › What is “3-phosphoglyceryl-lysine or pgK”? “3-phosphoglyceryl-lysine or pgK” is a newly discovered functional protein modification! The more scientists look the more they find ! Can this new functional amino acid modification provide insights in the causes of diabetes, cancer, and other metabolic disorders in humans? The recent discovery of this new modification in proteins of the glycolytic pathway of a cell suggests that this maybe the case. Moellering and Cravatt from the Scripps Research Institute reported in the August 2, 2013, issue of Science that they have discovered a new functional lysine modification. The paper describes that the primary glycolytic intermediate 1,3-bisphophoglycerate (1,3-BPG) reacts with specific lysine residues in proteins to form 3-phosphoglyceryl-lysine (pgK). Furthermore, their data suggests that this reaction does not need any enzymes to occur. A technique called “proteomic profiling” allowed the researcher to identify these modifications on several classes of proteins. However, most of the modification sites were primarily found on glycolytic enzymes. Moellering and Cravatt found that 1,3-BPG forms a stable, covalent modification on lysines of GAPDH in vitro. 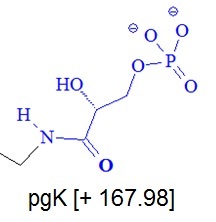 pgK is formed by a reaction of a lysine ε-amine with the acylphosphate functionality in 1,3-BPG. This modification was detected and identified on tryptic peptides by LC-MS/MS analyses of the modified proteins. The modification causes a mass shift of 167.98238 daltons on the modified lysines which can be detected in the mass spectrometer. The researchers speculate that the pgK modifications constitute an intrinsic feedback mechanism by which a reactive central metabolite, 1,3-BPG, regulates product distribution across the glycolytic pathway in response to changes in glucose uptake and metabolism. Cells synthesize proteins with the help of ribosomes which translate a messenger RNA sequence into a specific protein. The resulting proteins may then be post-translationally modified. Protein post-translational modifications (PTMs) increase the functional diversity of proteins by covalently modifying amino acids that make up proteins and peptides with functional groups or proteins, proteolytic cleavage of regulatory subunits or degradation of entire proteins. 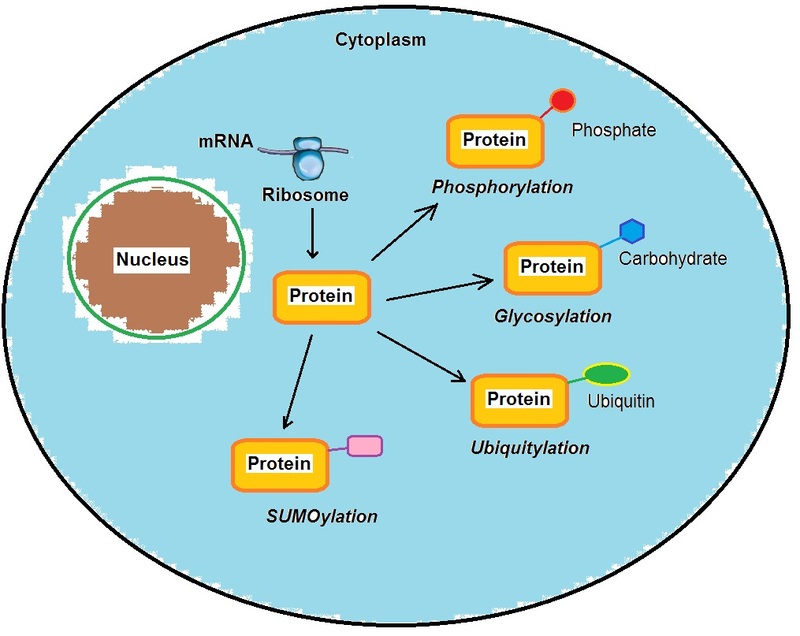 Typical PTMs utilized by cells are phosphorylation, glycosylation, ubiquitylation, nitrosylation, methylation, acetylation, lipidation, proteolysis and SUMOylation. These modifications influence almost all aspects of normal cell biology and pathogenesis. SUMOylation is mediated by the protein Ubc9 and results in the formation of a glycine–lysine isopeptide bond between the target protein and a SUMO protein. SUMOylation can occur in the cytoplasm or the nucleus. Proteins in cells are regulated by reversible small-molecule binding and reversible covalent PTMs and many intermediates in primary metabolic pathways. The protein systems can act as a form of feedback or feed forward regulation. In general PTMs are introduced onto proteins by enzyme-catalyzed processes but interactions between reactive metabolites and nucleophilic residues in proteins are also possible. However, scientists presently do not understand all metabolic regulations completely. The researchers used HEK293T, OVCAR3, SKOV3, MCF7 and COS7 cells for their studies. HEK 293 (Human Embryonic Kidney 293) cells are a specific cell line originally derived from human embryonic kidney cells grown in tissue culture. OVCAR-3 cells are used as a model system to study drug resistance in ovarian cancer, and the presence of hormone receptors in this cell line is thought to be useful for the evaluation of hormonal therapy. SKOV3 are ovarian adenocarcinoma cells derived from a human 64 year old Caucasian female. MCF-7 (Michigan Cancer Foundation-7) cells are a breast cancer cell line isolated in 1970 from a 69-year-old Caucasian woman established in 1973 by Herbert Soule and co-workers. COS cells are a fibroblast-like cell line derived from monkey kidney tissue. The COS-7 cell line was derived by Yakov Gluzman in the early 1980s from the previously established CV-1 African green monkey kidney line by transformation of the normal cells with an origin defective mutant of simian virus 40 (SV40) that codes for the wild-type virus T-antigen. The cell line is generally utilized as a transfection host. R. N. Buick, R. Rullano, and J. M. Trent; Comparative Properties of Five Human Ovarian Adenocarcinoma Cell Lines. CANCER RESEARCH 45, 3668-3676, August 1985. Raymond E. Moellering, Benjamin F. Cravatt; Functional Lysine Modification by an Intrinsically Reactive Primary Glycolytic Metabolite. Science 2 August 2013: Vol. 341 no. 6145 pp. 549-553. DOI: 10.1126/science.1238327. Soule, HD; Vazquez J, Long A, Albert S, Brennan M. (1973). “A human cell line from a pleural effusion derived from a breast carcinoma”. Journal of the National Cancer Institute 51 (5): 1409–1416. PMID 4357757. Jensen FC, Girardi AJ, Gilden RV, Koprowski H (July 1964). “Infection of human and simian tissue cultures with rous sarcoma virus”. Proc. Natl. Acad. Sci. U.S.A. 52: 53–9. PMC 300571. PMID 14192657. We are eager to help you with all your scientific research needs! ‹ What is the “intelligent knife” also called “iKnife” or REIMS? This post genuinely peaked our interest. This is a really good read to me. Must concur that you are one of many coolest writer I ever before saw. Many thanks for posting this useful information. This was exactly what I was on looking for. I am going to come back to this web site for sure! I will be very enjoyed for this website. Its an instructive topic. This help me greatly to solve some problems. It’s opportunity are so fantastic and dealing style consequently speedy. It may be assist all of you. Thanks.